The race to bring home news of the outcome of the Battle of Trafalgar was an unusual contest between a little-known West Country man in the small schooner Pickle, and a well connected, ambitious captain of a smart and fast ship, the 20-gun brig Nautilus. It was customary to choose a favourite officer to take the admiral’s dispatches home, knowing that the bearer would be promoted and receive a reward. However, Admiral Cuthbert Collingwood, who had succeeded to the command of the British fleet on Nelson’s death, needed every ship and every officer to maintain the blockade on Cadiz and to get his ships, damaged by battle and by the great storm which afterwards blew out of the Atlantic, into Gibraltar. His choice fell upon the Ilfracombe born Lieutenant John Richard Lapenotiere, whose ancestors had come to England with William III, and who commanded the second smallest British warship off Cadiz. Besides Collingwood’s concern for the fleet, he had political and strategic duties, so not until three days later was he able to complete his dispatches. Two more days passed before he could spare a ship to send them off. Admiral Collingwood’s selection of so junior an officer was unusual. According to tradition, Lapenotiere had saved Collingwood from shipwreck and he had promised to return him the favour. Collingwood is supposed to have reminded Lapenotiere of his promise, saying: “Now take these dispatches to England; you will receive £500 and your commander’s commission,” adding, “Now I have kept my word”. Unfortunately there is no other evidence for this story, and the two do not even seem to have served in the same ship. Collingwood’s own explanation was that he had “no means of speedier or safer Conveyance”. His written orders to Lapenotiere were that he should “proceed [to] Plymouth [and] you are immediately to forward the accompanying dispatches to the Secretary of the Admiralty, by taking them yourself express to him … Should you be prevented by an Easterly Wind, from fetching so high up as Plymouth you are to make the first port you can in England and using every exertion, that a moments time may not be lost in their delivery”. The log of the Pickle records that on 26 October: “At noon the boat returned …….made sail for England”. 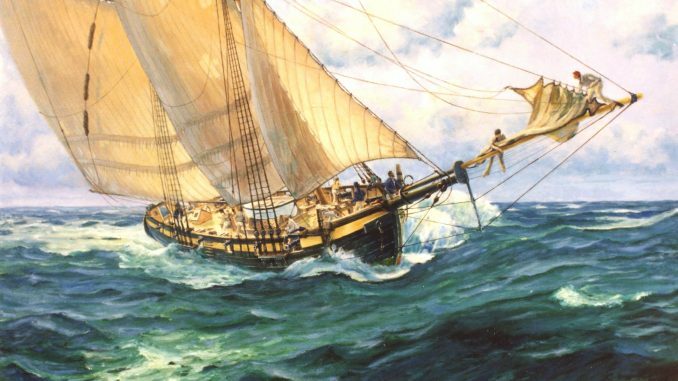 It took two days for the Pickle to beat out of the Gulf of Cadiz against strong winds and heavy seas. So far, Lapenotiere’s only competitor in this race was the weather, but on the afternoon of 28 October off Cape St Vincent, as Pickle was beginning to free off before the wind, the doughty schooner was intercepted by Commander John Sykes in Nautilus. 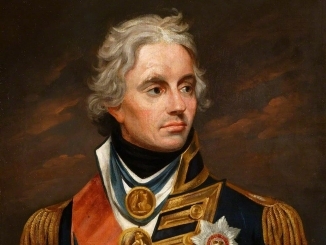 Sykes had been stationed there by Nelson the previous month with orders “to Cruize …..off Cape St Vincent” to give southbound British warships “a Copy of the General Order and Rendezvous of the Fleet… Should the Enemy’s Fleet from Brest make its appearance I desire that you will join me with an Account thereof with the utmost dispatch”. The Pickle and Nautilus would have recognised each other because on 29 September Lapenotiere had signed as having read Sykes’ copy of the general Orders. It’s possible too that Lapenotiere and Sykes may have known each other, if only because they were among that elite of explorers who had, before the war, visited the Pacific. The Pickle’s log reads: “Hove to speak to the Notlis (sic) the captain of the Notlis came onboard”, and the two ships continued beside one another northwards for several hours while Sykes and Lapenotiere were engaged in talks until about 5.30pm. Lapenotiere must have described the battle which he had witnessed at close quarters, but he refused to give up the dispatches, referring instead to verbal orders he had for Sykes to go into Lisbon and that he, Lapenotiere, should not be detained. It was dark when Sykes returned to his own ship. 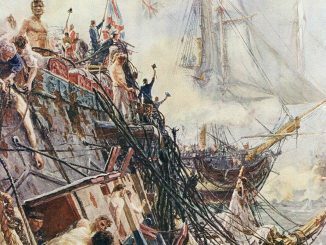 Next morning, off the mouth of the Tagus, Sykes fired signal guns for nearly two hours to attract a boat, and at about 9.15am he boarded a Portuguese vessel and sent his letters to Lisbon. In one of these he explained to Collingwood why he was about to disobey orders: “I have venture[d] to proceed, solely activated by zeal for the service, and in hopes to meet your wishes on the occasion, in becoming a security for the information of the Pickle should any accident befall her”. By noon, the Nautilus was clear of the Rock of Lisbon and the race against the Pickle was on. By the next day, 30 October, despite her detour to the Tagus, the Nautilus caught up with the Pickle off the Burlings. She was still in sight on the 31st when yet another gale blew in from the southwest. That morning the Pickle had sprung a leak and may have come close to foundering: about 5am on 1 November, Lapenotiere, for the safety of his ship, ordered four guns to be heaved overboard. When the Pickle reached the Channel he had no idea how far ahead the Nautilus was, and little idea of where the Pickle was except by dead reckoning. Perversely, the wind dropped right away for a few hours and Lapenotiere had to order out sweeps, large oars with three or four men at each of them, to keep the Pickle headed northwards. Then, on 3 November the 74-gun Superb, outward bound to join the rest of the fleet off Cadiz, delayed the Pickle further by ordering its captain to board. Lapenotiere must have despaired – even if he was first to land at Plymouth there was the possibility that the port admiral there might give the dispatches to one of his favourites. Instead, at 9.45am on 4 November, Lapenotiere landed at Falmouth and ordered the Pickle to proceed further along the coast to Plymouth without him. Concern for the safety of Collingwood’s dispatches, whether from the dangers of the sea or the violence of the enemy was justified, and the Nautilus, which was now ahead of the Pickle, had run into a French squadron off the island of Ushant on 1 November and was forced to make a large diversion to the east to escape. Despite this setback, the Nautilus was off the coast of Plymouth on the evening of 4 November and Sykes was rowed ashore, where he landed before midnight. The Nautilus had beaten the Pickle to Plymouth. The port admiral, not knowing what had happened to the Pickle, immediately sent Sykes off by post chaise to London. In fact the Pickle reached Plymouth about 9am the next morning. However, Lapenotiere had taken a post chaise to London by a northern route across Bodmin Moor through the towns of Launceston and Okehampton, avoiding Plymouth altogether. His expense claim for his journey to London for £46 19s 1d, over six months’ pay for a lieutenant, has survived showing that he used 21 changes of horses to travel some 270 miles in 37 hours, via Exeter, Dorchester and Salisbury. Sykes’ journey is less well documented, but for a single reference. On 6 November, Captain Robert Tomlinson in Dorchester wrote to his brother in London that “on Tuesday 5th November about Noon, two officers of the navy came through this Town, following each other, at about an hour’s Space of Time, in two Post-Chaises and four Horses to each, from the Westward; the first reported that he brought good News of great Importance, and the second, that his Dispatches contained the best and most capital News that the Nation ever experienced”. It seems that Lapenotiere with the written dispatches was still behind Sykes with the verbal news which Lapenotiere had given him off Cape St Vincent, over 1,300 miles away and nine days earlier. However, London that night was shrouded n fog and the post chaises were reduced to a walking pace. Somewhere in this fog Sykes got lost and was overtaken by Lapenotiere. It was indeed Lapenotiere who arrived at the Admiralty at about lam on 6 November, some minutes before Sykes. 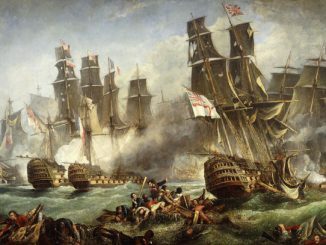 Lapenotiere had won the race, and announced himself to William Marsden, secretary to the Admiralty with the words: “Sir, we have gained a great victory, but we have lost Lord Nelson”. Lapenotiere was promoted to commander, presented with a £100 sword from Lloyds’ Patriotic Fund, and a £500 reward for bearers of important dispatches. This was in addition to prize money of £65 11s 5d and a share of he Parliamentary Award of £161.